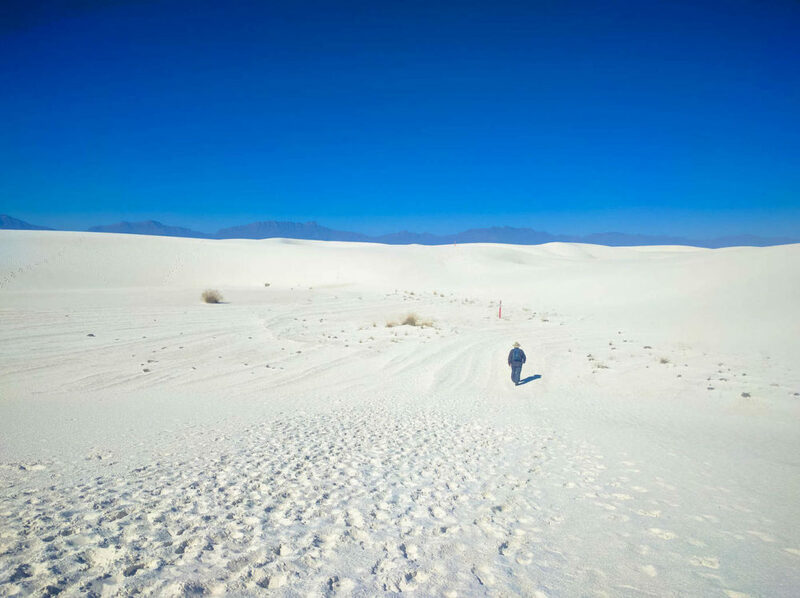 White Sands National Monument is the culmination of a process that started over 250 million years ago when the planet had a single continent and the land was covered in a shallow inland sea. Over the next 180 million years, Earth’s tectonic plates shifted and collided, and while soil covered the gypsum-rich seabed on the surface, the earthen crust rose into towering mountains. The following 50 million years, additional plate tectonic movements forced the mountains apart forming a basin in between. This created the beginnings of two mountain ranges we can still see today: the San Andres Mountains and the Sacramento Mountains, both rich with gypsum. During the last major Ice Age, which happened about 1.8 million years ago and lasted until about 11,700 years ago, ice and water tore through the mountains and then collected in the basin to form the ancient Lake Otero. As the Ice Age receded, Lake Otero’s water dried out and in the next thousands of years, a dry lake bed remained. Today that area is known as Alkali Flats. With the forces of erosion, the gypsum deposits supply the White Sands with its namesake. Last Mid-October, I stood upon that white bright sand which took millions of years to get here. At first glance, the dirty sand berms on either side of the road remind me of Alaska late in the winter season. There are kids on colorful plastic disks sledding down hills and adults trying to keep cool. But upon leaving the truck, and hiking a few miles, we came upon a world of eerie white wonder. Soaptree Yuccas in the sand – are they young plants or did they get buried? Even in October, the day temperatures can reach up to the to mid-80s. Because of the extream heat, trails are marked one level higher than normal. Alkali Flat Trail is no exception and is marked strenuous. There is no shade nor water over the 5-miles hike, which goes up and down bright white dunes. Do not touch strange objects! Debris from missile tests tends to fall onto the sand. Touching them may detonate the object. If you find something, note the location and tell a ranger. I never really thought there could be a danger of detonating one’s self out in White Sands. Then I remembered the nearby White Sands Missile Range, which also included the Trinity Nuclear Explosion Site of 1945. We later tried visiting the Missile Range, but our Washington state drivers licenses didn’t count as valid federal IDs. Keeping note of these rules, we set out toward the dry lakebed of Lake Otero, one of the main sources of the white gypsum sand. About 1 mile in, the multitude of footprints fade, and a spectacular view of endless white sand surrounds us. We climb steep dunes into the heart of this amazing desert. In the distance, I can see the dark silhouettes of the San Andres Mountains and the Sacramento Mountains. I’m tempted to pick a ridge and follow it, but I know its best to keep to the trail markers. 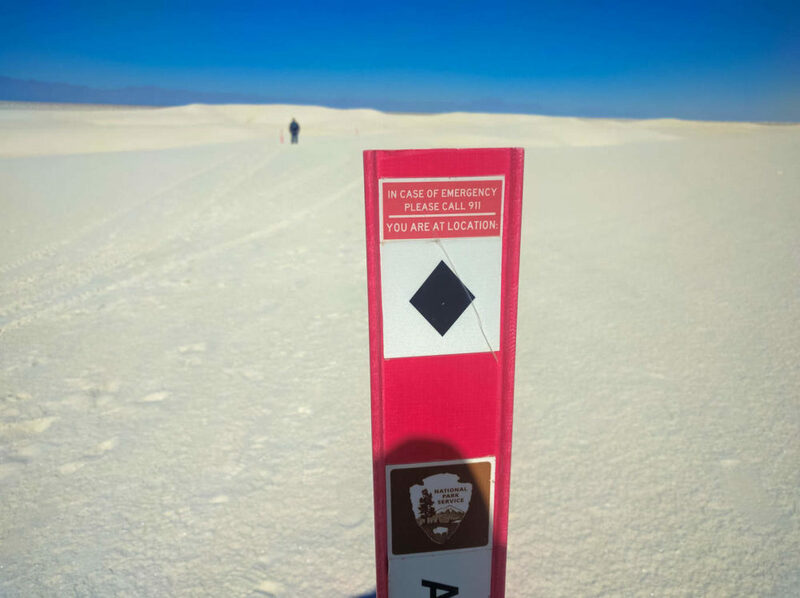 Thankfully, the bright red fiberglass posts marked with a black diamond stand out in the white vastness. On the surface, it seems like there isn’t much here except the white burning sand and the mounting heat, but with careful eyes, we find tracks of birds, insects, reptiles and snakes. In between the dunes where there is some shelter from the wind and where water tends to collect, plants take hold atop a black bio-crust soil. I can easily identify the Soaptree yuccas and Skunkbush Sumac, but the grasses and shrubs are too numerous to make out. I take simple delight in finding plants that survive in this harsh nutrient-poor alkali soil. With keen eyes, we spot insects that have adapted to the White Sands: Darkling Beetles threaten to spray their stink as you approach them, while Sand-Treader Camel Crickets frantically hop away into the nearest cover. Multitudes of Harvester Ants take any opportunity to steal away your food crumbs the minute it hits the sand. At the midway point, we reach the dry lakebed of Lake Otero. I try to imagine a 1,600 square mile lake, that formed over millions of years ago during the last Ice Age. Did Mastodons, Mammoths, or other megafauna drink at Lake Otero’s shores? I know that when the Ice Age ended, the water in Lake Otero took over 14,000 years to dry up. At the end of that era, the area became part of the Chihuahuan Desert. Instead of a lake, there is a flat playa filled with selenite crystals buried under clay and silt. I’m rather awed by the fact it took 10,000 years for those crystals to be pulverized and turned into sand by the wind, rain, and frost. Inch by inch, constant and strong southwest winds blew the sand grains around the lakebed and in the greater Tularosa Basin. Knowing that Hitch isn’t the contemplative sort when in extreme heat, we pack up and hike out on the second half of the loop trail. Our pace is slow as the heat rises. At this time of day, the only animals stupid enough to stir in this heat are us. Mammals, reptiles, and bugs know that the best time to move about is at night. With sweat pouring off our bodies, we take refuge in the truck and rejoice in the modern technology of air conditioning. Thanks White Sands National Monument, you’re cool but you’re also burning hot! Follow the Trail Marker! Don’t get lost! Too hot? Hitch looks okay. 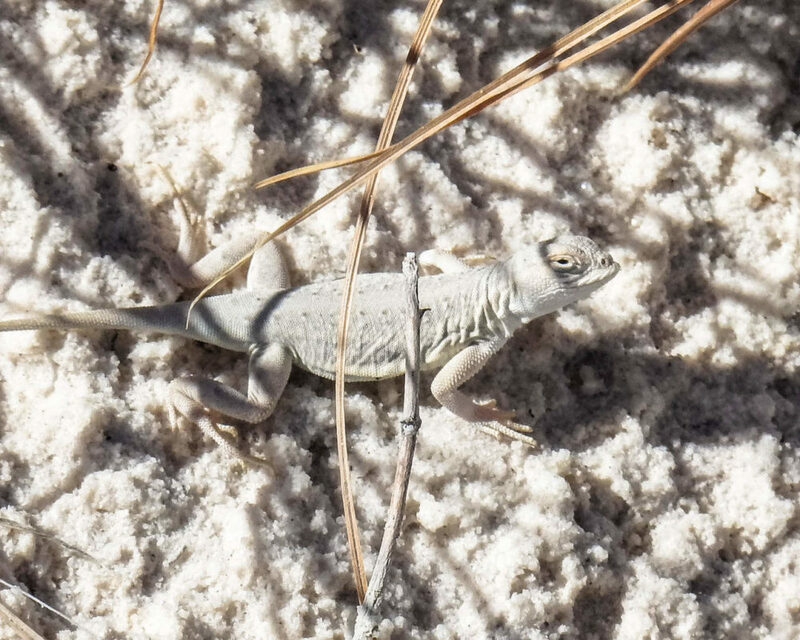 We think this is a small Bleached Earless Lizard.